This opera by Valentyn Bibik (1940-2003) is based on Mikhail Bulgakov’s famous play of the same name. The well-known Ukrainian composer finished the opera’s first and se­cond versions in 1972 and 1984, respectively. 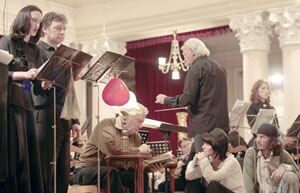 Ukrainian musicians have been waiting for the premiere of this opera for almost 40 years (! ), but Bulgakov and Bibik were, unfortunately “out of vogue” in the 1970s-1980s. (Incidentally, the composer himself wrote the libretto on the basis of the play.) In the 1990s opera was the last thing to care about. Nothing would have changed if Roman Kofman had not intervened. The conductor has not only held dozens of rehearsals and a triumphal premiere: in collaboration with the composer Oleksandr Shchetynsky, he made his own version of Flight’s score and a piano reduction, and staged a real extravaganza. And, what is more, he virtually made the performers fall in love with Bibik’s music. A whole “army” of musicians took part in the premiere: the National Philharmonic Symphony Ochestra, the Credo chamber choir, the men’s group of the Anima choir, the group of boys and youths of the Revutsky Municipal Chorus, and two dozens of Kyiv’s best vocalists. The latter did not sing, as usual, “from aria to aria” (incidentally, there are no arias in Bibik’s opera, for it is written in a melodious recitative, with utmost care taken of Bulgakov’s text): they exerted themselves to the limit — passionately, brilliantly, and acting in a most convincing manner. One of the initiators, inspirers and witnesses of this production was Bibik’s younger daughter Viktoria, a concert pianist. She was her father’s private secretary: she would conduct business correspondence, type scores on the computer, and do a great deal of other “invisible” work. Today Viktoria is coordinating hundreds of the performances of Bibik’s works throughout the world. And nobody else but her can tell us who Valentyn Bibik really was and why it took the opera Flight, one of his outstanding oeuvres, a solid forty years to reach audiences. “My father’s music has always been played in Kyiv — from his first works onwards. In spite of stubborn resistance on the part of some of his older colleagues and the authorities, his music could still force through into concert halls thanks to the performers who liked and defended as much as they could my father’s oeuvres,” Viktoria Bibik told The Day. “Many of the Kyiv premieres featured Ihor Blazhkov who had recorded father’s solo disc at the Moscow-based company Melody back in the early 1970s. Roman Kofman also began to play father’s music in those years. His works were also performed by the Kyiv Chamber Choir conducted by Viktor Ikonnyk and by the Moscow pianists Igor Zhukov and Yury Smirnov who gave concerts here. Father stayed in close contact with the conductor Georgy Vazin, the violinist Bohdan Kotorovych, and the bass Yevhen Ivanov. The very first performances engendered a circle of admirers amongst his colleagues, including composers and musicologists. He made friends with Valentyn Sylvestrov, Leonid Hrabovsky, Vitalii Hodziatsky, Olena Zinkevych, and Maryna Cherkashyna. “After my father’s death in 2003, as I was busy organizing performances of his music all over the world, I was deeply distressed at the fact that only musicians and audiences of his generation knew Bibik’s works, while young people were almost ignorant of him (his works have rarely been performed in Ukraine over the past 10-15 years). In 1994, when Mr. Bibik was already a well-known composer and pedagogue, he left his native Kharkiv and moved to Leningrad (Saint Petersburg). Why? “In Kharkiv, we lived in a very inte­resting milieu. We were in fact neighbors to the prominent musician Regina Horowitz, a sister of the legendary pianist Vladimir Horowitz. Father showed her Thirty Four Preludes and a Fugue. He mingled with many outstanding musicians. He would make frequent and long visits to Kyiv, went many times to Moscow, and had friends in Leningrad. It so happened that I had not been staying in Kharkiv since the mid-1980s — I first went to Moscow for studies and then to Leningrad, whereas father remained behind in Kharkiv until 1994. I can remember very well his last solo recital in Kharkiv in 1993. I played Thirty Nine Variations on Dies Irae. The soiree drew a full house, but father was totally confused. Many old-age people had departed this life, and that was also the beginning of a mass-scale exodus of young musicians. The composer Vitalii Hubarenko and his wife, the musicologist Maryna Cherkashyna, had moved to Kyiv, and the circle of friends was growing ever more narrow. Meanwhile, a nasty atmosphere reigned in Kharkiv. So this raised the question of leaving the city, although he would have never left under different circumstances. What he considered the most important things were home and peace. In Kharkiv, he lived quite a comfortable life: a huge apartment that was always open to many musicians who would come from the US, Moscow, Petersburg, etc. Father’s students would spend days and nights at our place, and I was so glad to see many of them at the Flight premiere. He supported and helped more than one of them. Now they come up to me and recall the past, and this makes me teary-eyed. “It is now in vogue to beat oneself in the breast and say: ‘You left, but I stayed behind, I didn’t leave!’ Dissidence was once a matter of pride, now it is patriotism. Father regarded both of his serious relocations as some external events. He had had close ties with Leningrad for a long time. His friends lived there, including composer Boris Tishchenko, conductor Aleksandr Dmitriev, music critic Mikhail Bialik, father’s pupil, composer Leonid Desiatnikov, pianist Oleg Malov, violinist Aleksandr Yuriev, and many others. And when it became clear that relocation was inevitable, father chose Leningrad. All things went smoothly: working at the conservatoire, communicating with people… For Leningrad was an incredibly complex city — it was not Moscow to which people were rushing from all over the Soviet Union. So what forced him to leave this city, too, and move to Israel? I wonder how a venerable-age maestro managed to switch first to English and then to Hebrew! What were the conditions in which Bibik composed the opera Flight? What happened to the opera then? The opera is full of many brilliant ideas, as far as the music’s texture is concerned — different stylistic layers overlap, Orthodox and Oriental music is mixed with jazz. All the vocal numbers can be heard very well (the only duet is in the finale), a capella monologues create a great impression, and there are abrupt drops of human passions — love, starvation, treason — to “requiem-like” choral interpretations. This raises the question: what was Bibik’s attitude to religion? Is there a hope that the opera will be shown in Kyiv not only in a concert version but also on theatrical stage? What important productions are expected in the nearest future?